How important are the dimensional tolerances? Does the imported brick data reflect actual Refractory ASTM Standards? How important are true brick properties, such as brick Thermal Conductivities, to your project? On any project or repair, is it worth a possible failure to save 2-3%? Should the brick fail, and after installing for a second time, how much am I really saving? Should the brick not be within your standards or fail, who am I going to call to have the material returned or replaced? 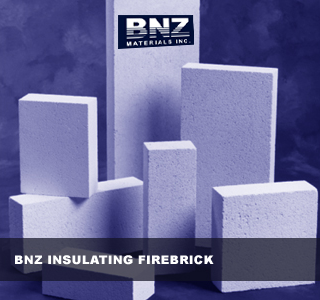 BNZ not only stands behind our insulating fire brick, but all our manufactured products. Should you need expert advice, have questions or have any material issues, as your partner, we are here to work with you.